When I am in Pittsburgh on the weekends I attend an old historic church in downtown Pittsburgh. I attended there this past Sunday. There was visibly present armed police officers outside of the church. 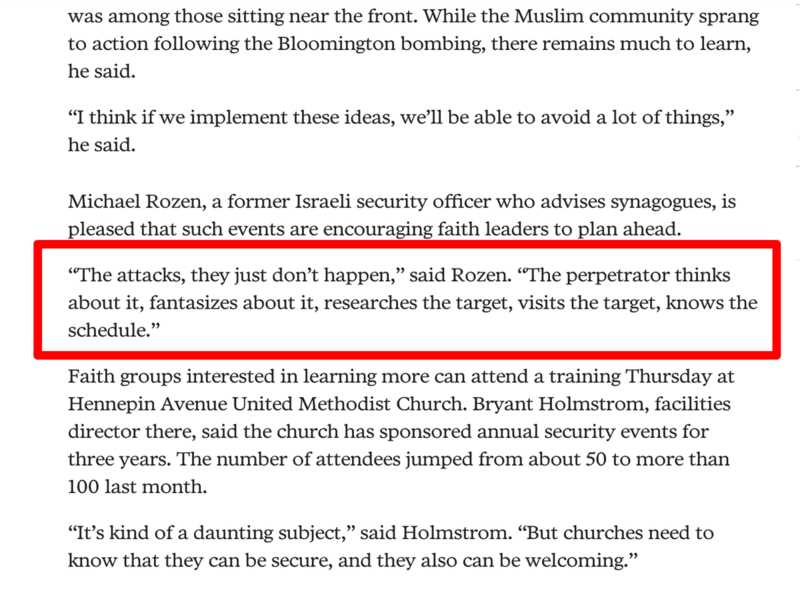 I am assuming that this is more in relation to the Jewish synagogue shooting down the road, but I think that churches are starting to take this more seriously. This isn't always about arming people in the church either. A church can hire a local off duty police officer to stand outside or in the lobby for anywhere from $35-$50 an hour. I would much rather do this than arm church members, who oftentimes really do not have proper training. I have been in some churches where they arm some of their members, and it has seemed a bit dangerous. They went to a local gun safety class, which has nothing to do with how to defuse a situation or to take down an attacker in close quarters with many innocent citizens around. They carry a .40 or .45 gun because they heard that has the most stopping power, without realizing that they most often will travel through the assailant and harm innocent people. After the shooting in Texas, we talked to a security expert. As big of a fan of the second amendment as he is, he cautioned us against having members carry. According to him, unless the person is trained in live fire situations, it will only make the situation worse. A member who is also a Federal Marshall confirmed what he said. She said that with all the training she's had, she's not trained in live fire situations and would be hesitant to pull her gun in the event of a live shooter in a crowd. We were encouraged to do things like make sure that ushers greet and make eye contact with all visitors, have glass doors (being able to see into the sanctuary can be a deterrent), have a member sit against the back wall and prepared to tackle a shooter (in fact, having multiple men throughout the sanctuary ready to do so), security cameras visible (which we don't have), limit access to the building during the worship service, etc. About a month after the Texas shooting, a visitor entered the sanctuary during a song. I was service leading, and saw him enter. He was disheveled, looked angry, and was carrying a large duffel bag. An usher attempted to greet him, but he ignored him and strode right down the center aisle. As he walked towards the front (and me), I did quick mental "war games" in my head, decided that if he paused and made any move to that bag I would have enough time to jump off the platform and tackle him. I positioned myself to the side of the pulpit. Thankfully, he didn't stop, but walked around front pew, down the side aisle, and sat down. He sat down in the same row as a man who is in law enforcement, and who was very aware of the man. I remember thinking that I was glad as I wasn't preaching that day, because I didn't know if I'd be able to focus. I sat down in a position that I could keep in eye on him, and wondered if my aim was still good enough to hit him with a hymn book if he stood up. Thankfully, it ended up that he had just finished working out at a gym and decided on his way home to go to church. Also, thankfully, members of the church acted appropriately. After he sat down, an usher came and greeted him while we were singing and gave him a bulletin. Comparing notes after, the man sitting behind him was prepared to tackle him if he stood up. In fact, several men (and women) ran scenarios in their mind and had decided on a course of action if anything had happened. I'm so glad that the visitor didn't have to use the bathroom during the middle of the sermon. So close to the shooting in Texas, we were probably more on edge than we should've been, but he did look and act sketchy. I wanted to ask him why he thought it was a good idea to walk down the middle of the sanctuary carrying a large duffel bag, but he was a visitor and I didn't want him to feel unwelcome. He never came back, though. Unfortunately, they don't pay me to say so. ALERRT is probably just as good/better (https://alerrt.org/), but they are more specialized in training first responders. ALICE trains many, many, churches and schools and businesses. I think there are some big misconceptions about carry permit training, and having actually been through it, I think I'm halfway qualified to comment here. First of all, it should be noted that if the evidence were really out there that allowing permit holders in a place caused problems, it would (a) be in the news constantly and (b) every supermarket in the country would be posted "no carry". The evidence simply isn't there. The reason for this is that permit training is not a flippant sort of thing, but rather does indeed teach tactics--the MN duty to retreat is almost always good tactics, by the way--as well as things like weapon and ammunition selection, along with "know who's behind your target". That's why we read far more about good outcomes from citizen carry than bad ones--well, unless our only reading about the matter is from the Annenberg Foundation's partners like the Brady Campaign, of course. Along those lines, the big problem with weapons chambered with 10-12mm rounds (.40S&W, .44 mag, .45ACP, etc..) is not over-penetration--a lot of smaller rounds penetrate far more due to higher muzzle velocity, and choosing expanding/fragmenting ammunition mostly solves that problem. The big problem with large bore weapons is concealability and putting rounds on target. Flinching when shooting is a common problem that drives a lot of people to 9mm and .38 special--as a proverb says, "I'd rather be missed by a .44 mag than hit by a .22LR." Concealability is also one of the huge issues that drives the success of shall issue carry laws--if you have an off duty police officer in uniform guarding your church, it's obvious who's armed, and an active shooter simply avoids him or kills him first. No such luck with concealed carry, and that's why almost all mass shootings are in areas where concealed carry is not allowed. It's not a panacea for everything--carrying while drinking is rightly proscribed, and it wouldn't have helped with the Las Vegas shooter--but if we're going to talk about tactics, we ought to be discussing the tactic of surprise, where the little old lady surprises the assailant at Wal-Mart, or the like. Taking an 8 hour training course for concealed carry, compared to the 155 hours that a federal employee who carries a firearm is a big difference. I think a lot of people who carry, are naive. Not all of them. From my perspective, I would much rather have an LEO take care of a situation like this, than Bob, the church member who bought a gun and took an 8 hour class. First of all, it should be noted that if the evidence were really out there that allowing permit holders in a place caused problems, it would (a) be in the news constantly and (b) every supermarket in the country would be posted "no carry". The evidence simply isn't there. Expert opinion is evidence. Maybe not "proof," but neither is the argument from silence. .....if you can hire the guy with 155 hours training, I guess. That noted, typical officers get about 15 hours a year in training, an amount exceeded by a lot of hobbyists, and hiring them can cost about $87/hour. At my church--seven hours on Sunday and about three on Wednesday--that's about $45k per year, a significant portion of the total budget--for just one officer. Plus, the officer doesn't know our members like our security staff does, and he cannot adequately cover an entire building. Again, if we don't have compelling evidence (not just hypotheses, evidence) that citizen permit holders pose a danger, there's compelling evidence that the LEO option is not going to be accepted by most IFB churches, or even most evangelical ones. It's expensive to the point of becoming something of an equity issue vs. the pastoral staff. Regarding expert testimony, sure, it's worth something, but the counter-argument is not an argument from silence. It's a quarter century of data (really more) about millions of carry permit holders with minimal criminal incidents and many thousands of successful cases of self-defense. If "expert" testimony doesn't concede this point, then I have to question whether they are experts at all. Each church decides what they need to do. The average amount of training that an LEO receives out of the academy is 110 hours. You then have specialties and continuous training. An off-duty officer is about $45/hr in our area, and for us church is 3.5 hours on a Sunday (9am to about 12:30). My point is not whether a permit holder can defend themselves or whether they would create criminal incidents, it is that 1) they are not trained in active shooter drills or close quarter combat, but on how to self defend yourself personally against a individual attacking themselves. Two very different scenarios, with an extremely small amount of private citizens who are fully trained in active shooter situations. 2) I personally wouldn't want to put the ownace on a member of someone in our congregation to take someone's life, or be put in a situation where you can take someone's life. Especially when it might involve making extremely difficult choices in when to fire in a crowded situation or accidentally missing and hitting another congregant. I know we can all sound cool that we can take out an intruder and we can stand our ground, but when you actually take someone's life that is a totally different situation, one in which many are not prepared for and could suffer from issues for the rest of their life. Having a strong family member who was in a crime where people were shot and killed, they had serious issues for the next 60 years dealing with the situation. It is a very serious issue, and becomes even more serious when that person has the potential under an extremely tense filled situation (that even trained Navy Seals can make a mistake) to accidentally miss and kill a member of the church. I personally would not be the pastor who would want to put one of my congregants into that situation every. I’d say the unknown prospect of a concealed weapons carriers in a church is a deterrent. If the disturbed person knows that people at certain places are armed and he/she has no knowledge of who the said persons are that makes his/her mission more difficult and maybe enough to dissuade an attack. I chose not to carry since I have retired even though I can carry concealed in any state in the union. For 25 years I shot and trained quarterly and in shoot and no shoot situations. The training builds the muscle memory to react under stress. I’d say after 12 years that muscle memory is not all gone but probably greatly reduced. I think I could perform better than a guy with 8 hours of training but not much. Given what has happened in the US I have no plans to carry a concealed weapon. I don’t want the responsibility anymore, but I’m not against anyone in the church carrying concealed. Of course this is with the caveat that as long as he/she has an understanding with the Leadership in the church that he is not a Police Officer. They are not allowed to intervene in disturbances in the church not involving a firearm. No breaking up loud disagreements between church members be it family disputes or fighting over seats etc. A concealed weapons carrier in church should operate like a Sky Marshall. The Sky Marshalls do not get involved with unruly passengers or fights between passengers. That’s the Steward’s and Stewardess’ job along with the flight crew. They only react to a Terrorist that’s it. Hence Pastors and Ushers deal with disturbances of unruly church members.